In 16.8.66 the viewer first notices the vivid red expanse that covers most of the picture plane from the top down. This intense wash is uneven. Perhaps bits of underpainting show through the inconsistent ground helping it to pulsate and to sharply interact with the centered green bar. To the left and right of this focal point, a yellow-orange bar and a tart, yellow-green bar are forced against the edges of the canvas. Their placement takes on a double duty, providing both stability and tension. These stakes anchor the composition and jangle all at once with uneven and shimmering edges that vibrate against the red slivers of paint that barely confine them in their plane. The three bars hover slightly along the bottom border of the canvas connected by a darker forest green rectangle on the left floor and a muddied red-violet wedge on the bottom right side. These connectors also destabilize – particularly as the light green bar on the right balances precariously on the wedge’s thinner point. The colors and their opacity or lack of it are of tremendous importance here. The red-violet, dark green and yellow-orange are a calming tertiary triad while the hot red interacts with the lighter greens causing a jolt. Nothing in this work is sure. Just when the red envelops the smaller forms- seeping into their nooks and suspending them like insects in amber, the next glance sees that they are violently rejected. And they never seem to fit quite as securely into their niches when they are drawn back in. 7.11.66 [top picture] offers us a more comforting depiction of three-dimensional space and traditional perspective but even here assumptions prove groundless. This large canvas is divided into equal parts- what can be seen as a cobalt floor, rolled over dark green, supporting a rusty wall form on the left side and a solid grass green base holding up an inverted orange wedge, with a red wash drug over its surface leaving a residual ghost trail along the top, to the right. These forms/scenes sit like a zipper’s teeth between clamping rectangles of a hastily applied green wash that interacts and alters every edge it touches. Our three-dimensional touchstones are flattened, turning natural cubed spaces into mitered, jointed wedges shoved against the painting’s surface. 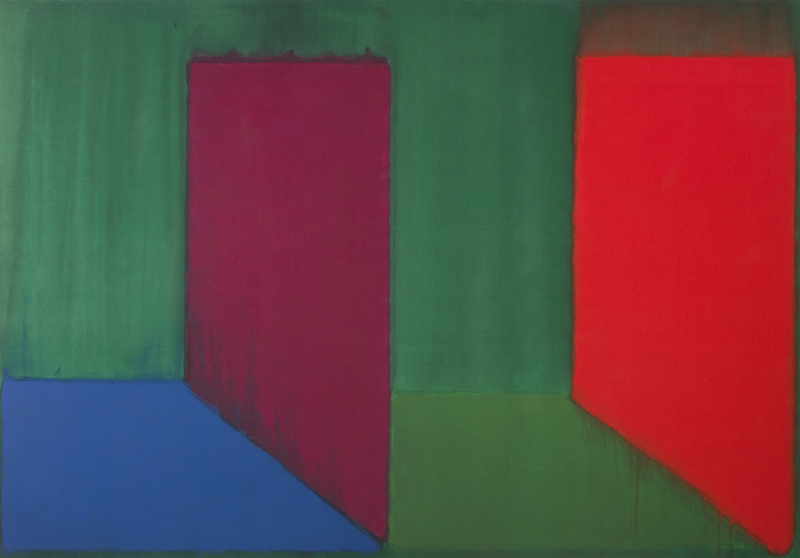 John Hoyland, “20.4.66”, 1966, acrylic on canvas, 229.5 cm x 304.8 cm. It would be interesting to hear about the reaction to this Hoyland show from the wider community of contemporary painters in New York – maybe the critics too? see the further reading links at the bottom of the article…. There has been some great coverage of the show which is great since a lot of painters I talk to over here were unfamiliar with his work. Robin put some links to other reactions under the review. Have you heard of Patrick Heron across the pond?! I mention him briefly in the review. I was being provocative (sorry)! It is interesting though – I think for the most part painters over here aren’t familiar with British painting , particularly abstraction from the 60’s – It’s a great shame. What is “Barnett Newman’s cropping is photography dictum”? A technique suitable for photographers in the darkroom not painters. Paul, you should perhaps explain why cropping is not suitable for painters. As a bit of an aside on this matter (re: cropping – which might be contentious for some), I am reminded of that procedure by which the painter as viewer will create a viewfinder with their fingers to isolate an area within a composition to decide whether it ‘works’ or not. Or the related way of adjusting ‘looking’ with one eye closed. The subsequent viewers will do this too. I don’t mean to speak for Paul, but I read this passage as not necessarily endorsing Newman’s position by saying flat-out that cropping is not suitable for painters, but rather reporting the procedural and ideological debates, or maybe options, that were in the air when Hoyland worked. Here is the passage from Newman I recalled off hand; maybe there are others: “The issue is one of scale, and scale is a felt thing. It is not something you can build or develop by relating parts of a painting or deciding after the fact how much of the painting is the painting.” Selected Writings and Interviews, p 272. It seems that this cropping is one way to circumvent the relational juggling that Frank Stella also found so dispiriting (the relation of parts), but Newman rejected cropping too and insisted that one, or that he at least, had to achieve this sense of totality through composition, not through any pre-given system. The above passage was from 1966. As he also said about Rauschenberg’s White Paintings: “Emptiness is not that easy. The point is to produce it with paint.” And while the white paintings were painted, they were not composed. Lygia Clark wrote about a “full-emptiness,” and that (from my screen admittedly) is the marvelous feeling I get from the Hoylands. “Full-emptiness” sound fascinating. It seems important to you. What does it mean? I asked Paul the question as it relates to an interesting debate around the importance, or not, of process in any evaluation/judgement of a finished painting. I evaluate the work mentioned by what is in front of me on the wall compared with the other work in the show. By mentioning the cropping ( and I’m just guessing by what I see) I’m only offering an opinion. I wasn’t there when Hoyland made the painting. I have no opinion on the use of cropping by a painter- and it’s not really that interesting to me- just providing context for what I Isaw and surmised. As far as the reception of a painting involves the perception (conscious or unconscious) of decisions made by the artist, cropping removes or at least distorts the context of most of the decisions, rendering them “unreadable” or at least falsifying their reading to a greater or lesser extent. The only clearly visible decision is that of the final cropping – “this, for me, is a painting”. This isn´t just a matter of process. I think it´s rather likely to affect the felt integrity of what´s there on the wall, and therefore its feeling of rightness / power of conviction. If Larry Poons was throwing paint in that film scene, then maybe the cropping didn´t obscure any/many foregoing decisions, which would make it less of an issue. We might not necessarily know for sure that a work was cropped or not. Should we care? is an interesting question. I stopped using cropping in my work four or five years ago because it didn’t feel ambitous, does in fact feel a bit like cheating, and has a relationship to photography. It doesn’t feel as ‘creative’, in fact feels reductionistic. That said I think that you could end up with an excellent work that have been cropped, or that has involved cropping as a fundamental part of the process. Cropping can also help with developing our own eye for what a succesful work can be (see Geoff’s comment). I don’t think that Tintoretto cropped. A photograph is necessarily cropped because what we see in a photograph is always, in principle, the world itself in all of its breadth and expanse. You can always ask what lies beyond the edges of a photograph because what is within is continuous with what is without. The physical limits of a photograph are the result of the physical constraints of the camera, which pre-determine the extent of the view it will accept. The limits of that view reflect or replicate the limits of the eye itself considered as a bodily organ – unlike some spiders (for example), we cannot have a 360-degree view from any particular bodily position. In this sense, cropping is built into the medium of photography. I can’t remember exactly when I first met Hoyland, but it was certainly before his one man show at the Whitechapel. He was already friendly with Brian Robertson by then. At the opening and at his request I introduced him to Lilian Somerville, Director of the British Council Fine Arts Dept. Shortly after he was selected for the Paris Biennale in 1965, by a sub committee headed by Norbert Lynton and Jaschia Reinhardt. He had already been inviting me down to his Kingston studio to see his paintings. My wife and I went to dinner there on several occasions. He was obviously pumping me for information about the workings of the Council, and other art world gossip, but recognising that I was a painter too, he was very friendly. So far as I am aware he painted on the stretcher, not off, and most of the painting was carried out with rectangular floor mops on long handles and rollers, onto cotton duck, using water tension breaker ( like Frankenthaler) to enable penetration of the colour into the fabric, which accounts for the haloes of bleeding around the “blocks” of colour. When Kenneth Noland saw these 60s Hoylands he said to him — “You’re Smart to go low” — since the effect is of blocks that have settled towards the bottom of a liquid container, or as if coloured lozenges have sunk to the bottom of a beaker of acid, and are being slowly eroded at their edges. You can see from the direction of the runs that the paintings have been turned around on the stretcher. Morris Louis’s veil paintings were a big influence at that time, and the running of paint in curtains without the evident agency of the hand of the artist , a background influence not only on these pictures but on Bert Irvin and Basil Beattie as well , on into the 70’s. I don’t think Hoyland was aware of Hofmann at this stage, although Hofmann’s painting, The Cliff, had been in the Gulbenkian exhibition at the Tate in 1964, and an early Hoyland too. The Cliff has no “blocks”. Patrick Heron relates that in 1959? Greenberg had taken him to Hofmann’s studio, being keen to see his reaction. Heron was not impressed. “This little old man heaving these heavy paintings around full of mechanically compounded cubist and fauvist cliches and strident sweet colours” is how he described them. Delia was equally unimpressed. 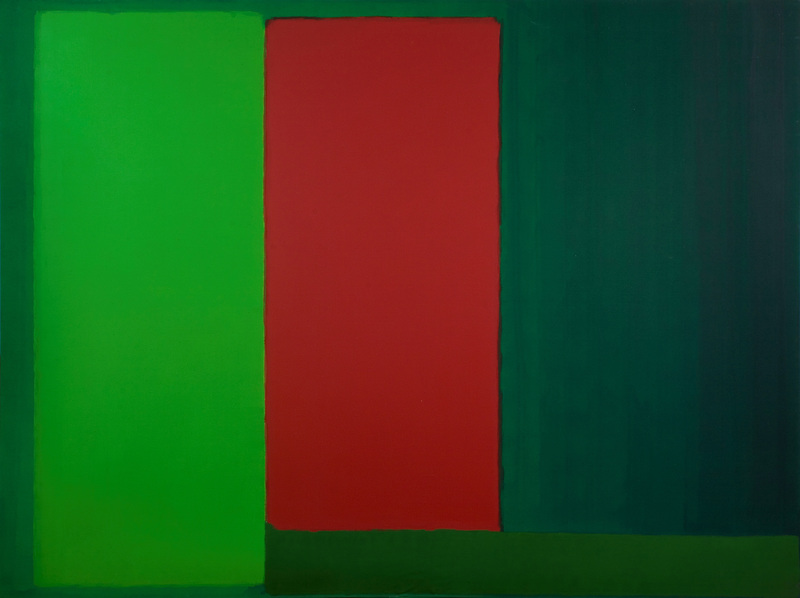 So it is possible that Greenberg also showed Hoyland some Hofmanns in 1964/65. But their effect would not appear until the mid 70s. Although Hoyland was not a Rowan Gallery artist, these 60s paintings have many resonances with the Rowan Gallery styles of simple, childlike formal arrangements, common to both the painters and sculptors associated with that Gallery, and an oblique nod to pop-art’s confectionary colours. William Tucker’s stacking of children’s toy like blocks, Phillip King’s Tra la la, Garth Evans’ floor reliefs, and Paul Huxley, Jeremy Moon and Patrick Caulfield’s neo-pop abstractions, are part of a common aesthetic at that time. I like the Noland quote – where / where was that said? The weighting of object-like structures to the bottom of the canvas is one of the central differences between Hoyland and Noland etc (much more than thickness or thinness of paint application). It is part of his connection to the European tradition of de Stael, but also bound up with his involvement in sculpture, Tucker in the earlier sixties, then Caro. I think the Rowan connections you list are relevant but only go so far, and certainly from the mid-sixties he was aiming at a much more resonant, heroic, sublime form of expression (although arguably he never completely abandoned the cool restraint of the sixties). 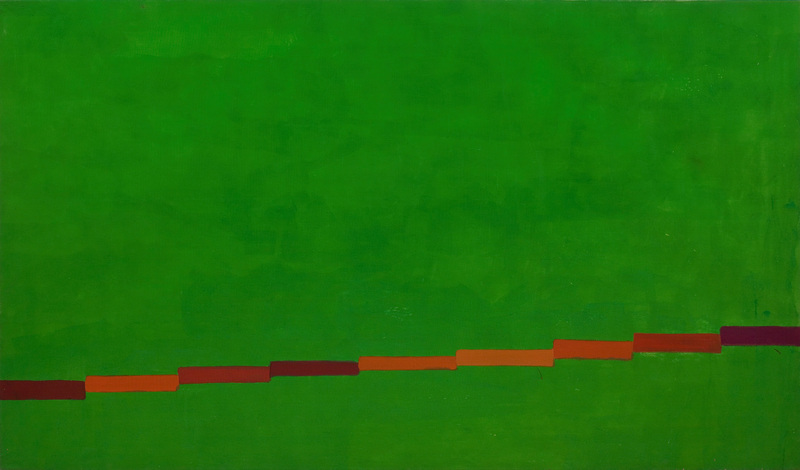 Greenberg showed Hofmann paintings to Hoyland at Samuel Kootz in 1964. Hoyland lived in New York for protracted periods in the late sixties and early seventies (I don’t have the dates readily to hand) and would surely have seen more Hofmanns during that time. Piri Halasz (see link above) has some interesting remarks about his involvement in the ‘Greenbergian’ scene, which I think she is right that Mel Gooding downplays. The Hofmann influence on Hoyland I would say arrives in the late sixties (round about 1968) when he starts working the contrast between an impasto block and an atmospheric expanse, particularly in his up-right ‘door’ paintings. Anyway it would have been his birthday today. Happy birthday John! Thank you Alan for your excellent insight and first hand knowledge. Can I ask, will you be teaching any painting workshops this year or any time soon? I haven’t got the text with me, but in an interview in the late seventies, when he looked back to Whitechapel exhibition that contained these paintings, Hoyland said something along these lines: Everyone went on about the colour, but I wasn’t thinking about colour, I was interested in placement. Thanks for commenting! Happy you enjoyed the review. The Noland quote was related to me from the horses mouth by Hoyland himself. You can’t get it all from published material! And sorry —once again google sees fit to re-edit. It’s Reichardt, not Reinhardt,! The inevitably inconclusive and problematical relationship between shared American and British influences in Contemporary art (leading to Abstraction in the 1950s/60s) is, perhaps, still unresolved – at least for those of us who are still enthralled by Patrick Heron’s take on the relationship between the New York School and the St.Ives painters. In today’s Guardian (12 Oct. – in print on p.34), Jonathan Jones responds to the Rebecca Warren exhibition at the expanded Tate St.Ives with references to modernism/abstraction in the St.Ives School. Also, who are the British rivals of Rothko and Pollock? Are you criticizing the “format” thing, Alan? I thought you liked all this stuff, or at least, you have had a bit of a go at me whenever I have had the temerity to criticize work from this period, like Tim Scott’s early work. Actually, I rather like these paintings, to a degree, and I think they are more sophisticated than you make them out to be, and quite inventive. I certainly think Hoyland was better than Noland from any period, and that was borne out by the Pace gallery show in London a while back with the two of them and Caro. And by the way, nice to see Paul writing for Abcrit again! Agree, it is good to see Paul’s writing here. Looking forward to Professor Pocaro’s next piece. Thanks for the opportunity, Robin. The blast of red/green, green/red bias of this period rapidly palls. It is bordering on the lurid, and the eye becomes satiated and fatigued quickly. Hoyland has nowhere near the range and subtlety of Noland as a colourist. From the targets, chevrons, horizontals and plaids, and then the shaped canvases, Noland explores the full gamut of colour’s expressive range and its space creating potential. Only when he attempted a more painterly approach, with more obviously different paint applications, and textures, were his limitations exposed. Although not necessarily about Hoyland’s work. Will you be writing us a review of Alan’s forthcoming show, John? Nor is there anywhere near the subtlety of Heron’s colour in the period 1958-62. Heron rightly regarded him as an arriviste and a 60’s fashionista. However he was also suspicious, seeing the American dimension to Hoyland’s “formats”, if you insist on calling them that. This did not prevent them from having a jovial relationship in person. Amazingly, I agree with you, but that is Heron’s very best period (perhaps ignoring some rather good early figurative stuff), and I’d extend it as far as “Fourteen Discs” of 1963. 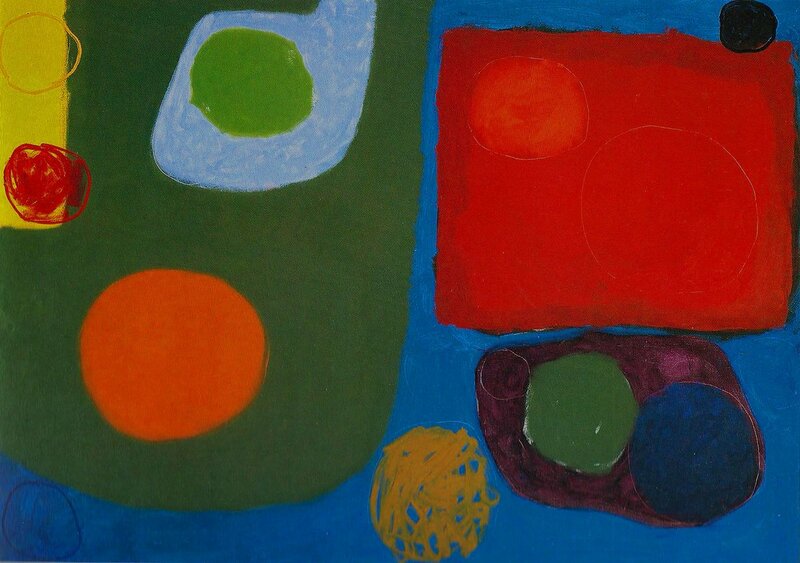 The rest of the sixties and all the seventies, I prefer Hoyland, whose late seventies work is his very best. After that it’s anyone’s guess who’s worst. Probably Hoyland. Ah, such connoisseurship! By then Noland is beyond the pale, along with quite a few others. Review of Alan Gouk or Alan Pocaro? Fourteen Discs is a painting I rescued from obscurity in a dark corner of Heron’s studio in St. Ives, and flagged up as one of his best in my writings on his work. He began to feature it prominently from then on. Why had he not shown it before? I suspect that Leslie Waddington had discounted it as showing too much the influence of Noland, even though it clearly shows Heron’s desire for a “ recomplication” and asymmetry of design. OK, I’m hooked. Where is the Noland influence in 14 discs, and why would Waddington have disapproved? And, yes, a more complex take on modernism, which goes towards why I like it – though it looks simple enough now. In the Richard Green Gallery catalogue of Heron’s 2006 show there , The Shape of Colour, Heron is shown in front of Fourteen Discs around the time it was painted, holding a grey catalogue of his 1962 Galerie Leinhardt show, up to the painting, as if he was contemplating adding something. I may be wrong, but it seems as if the painting remained in the St. Ives studio, and was not shown until the 1980’s? It might possibly have been shown in the Whitechapel retrospective in 1972, which unfortunately I did not see, but how can one know? I am struggling to account for the lack of visibility of this important painting, (for instance it was not selected for the British Council exhibit of Heron at the Sao Paolo Biennale in 1965, for which I was exhibition officer, and Alan Bowness and Herbert Read were selectors) and am just hazarding that it may have been felt that the sharpness of the surrounding of the Discs , even though far from symmetrical, owed something to the prevalence of Noland’s style at that time. Maybe Heron himself felt it, at a time when his militant anti-Americanism was in the ascendant, or maybe Leslie just felt the picture was too punchy to sit with the other Herons of the time? However I can hear expletives of outrage coming from Valhalla at the suggestion. Heron could be very damning at any suggestion of outside influences or the imputation of rivalry with the Americans. BTW. Fourteen Discs was painted before any of the Hoylands reproduced above. We would need to see an image of it to indicate why Heron would not have been particularly impressed by the young interloper. But I have been having great difficulty finding an image on the net that does it justice ( for Key Paintings Part 2). Most seem to be taken from catalogues rather than from the painting itself. Perhaps you will have better luck. By all means let us see it. I have tried and, like you, failed to find a good one. It is interesting to some extent, I admit. But does Heron help us evaluate Hoyland? They were part of opposing generations, consciously positioned against each other by critics, it is unsurprising Heron would have disapproved. Yes, historically, formally, of course. This is scanned from a book. Not great, and the yellow is a bit greenish. (Mel Gooding; Patrock Heron, 1994). I’ll try and photograph the photo in the book although it won’t be a lot better than Robin’s scan. The difference in scale and ways of delivering a variety of colour in Fourteen Discs seem to make Hoyland’s simple placements look quite basic and clunky. I do like this a lot and think it might be his best. And yes, I prefer it to these Hoylands. But I prefer these Hoylands to what Heron did afterwards, so precedence is no guide here, not even for Heron himself. There is something complex and terrific about the space in this painting, seemingly achieved with simple shapes, where the eye is led so brilliantly across and around the work in a kind of endless dance. It suffers not at all from the deadly graphic quality of the seventies. I am aware this thread responds to the Hoyland exhibition and Paul’s article but as we are mentioning Heron it is probably worth flagging up the Heron retrospective next year at Tate St Ives, May to September. All aboard the AbCrit Express for the Heron show! As an aside to this, in the Jazz world there is a whole crop of young musicians coming out of the “woodwork” (I love it), building on the best of the tradition, whether traditionalists or radicals, entirely serious and free from the cynical ironies that taints everything in the visual arts. This is because you can’t do anything in music without mastering at least some of the rudiments of the inherited “language”, all the way from Scarlatti and Bach to Charlie Parker. 1. The poisonous legacy of Marcel Duchamp, leading to coy commenting on the impossibility of direct unfettered communication, looking over ones shoulder, second guessing audience response. No serious art anticipates the responses of critics, curators or the savvy smart arse half educated cool. 2. The art theory industry, which is the literary theory industry. 3. The “new art history”, which substitutes Socio- political reportage for analysis of the formal innovations that concern painters. (Real painters, that is.) the avant garde has been redefined as anything that supports the agenda of marginalised minority groups, and the activists who would like to see artistic expression reduced to instrumental activity in gender politics and the like. 4. The agendas of the “curatorial consensus”, and the synergy of globalisation with big money forces. Need I say more. Just saying,! Nothing is more characteristic of serious art than its capacity or willingness to stand on its own and speak for itself; not its gravity or solemnity, but its knowledge of itself and what it is about and its willingness to let us in on the secret if we are up to the task, is what constitutes its seriousness. It accepts the fact of its being finished and standing alone in the world, and this is what commands our attention and repays the effort involved in getting to know it. A work that insists on anticipating the audience response doesn’t trust in itself; it refuses to accept the fact of being finished and its consequence, which is standing alone and resting on whatever authority it can convey, which is never known in advance. It is nervous, uncertain, neurotic and needy; in this sense, it reflects contemporary reality in lieu of offering a critique. It begs for attention, its self-knowledge is in the form of propositions rather than demonstrations, and refuses to trust the attention it receives, and its right about that if nothing else. I.e. unable to commit to a positive statement — this is where I stand — this is who I am — this is what I mean. And I don’t care what Rosalind Krauss has to say about it. Or anybody else for that matter! I need to say a bit more about 14 discs: When I say “the eye is led so brilliantly across and around the work in a kind of endless dance”, I need to counterbalance that with the thought that there is no overt (or even covert?) rhythm to that dance. I think that makes for the surprise and the invention of the work, to do this dance without the help of a clichéd rhythmic handling. When Heron hits the ‘hot spot’ there’s no defining this genius in painting. When will Unesco declare Eagle’s Nest a World Heritage Site? Go easy on the “genius” tag. That’s a pity, Carl, because you are missing out on a moment of inspired and unconsciously discovered pictorial invention and an example of a kind of freedom integral to the work itself, rather than to the artist – and apparently even Heron did not recognise it at first. Bravo to Alan if he really did flag it up. Olitski is by comparison a graphic plodder in 1960, as the work you link to demonstrates, about on a par with Heron’s poorest painting’s. And he really does get worse and worse as his career progresses, taking painting to a place of contrived banality. To John P. I’m delighted to learn that Mel Gooding, and presumably Patrick, confirm that Fourteen Discs remained at the St. Ives studio all the way from 1963 until I pulled it out from a dark ante-room and immediately recognised its importance. Patrick was not there, being down with a case of shingles in London. To Carl — if you knew the extent of Heron’s antipathy to the very qualities manifested in those Olitskis, you’ld see how unlikely an influence they could have been. Heron was arranging his surrounded Discs and ovoids like those in F.D. from 1958/59 onwards. Where F.D. differs is in a slightly sharper boundary between the colour shapes, and a more architectonic layout which engages the “ static and architectural at the same time as the fluent and spontaneous”. (Paraphrasing). “Single minded and forceful”. Olitski had moved from a Fautrier influenced French tachism, with thickly churned brown messiness, and soon moved on to narrow panels of sprayed fields without incident, except for a snail trail streak at one edge, sometimes cropped to “dramatise focus, as in photographic cropping” as I wrote of them at the time. And “the undisputed masterpiece of this period is Fourteen Discs”.?? When did that happen, and how?, since it was while writing the catalogue article for the Barbican retrospective in 1985 that I first saw it, and I don’t think it was included in that show? It was in the Tate retro. In 1998, and featured in Mel Gooding book in 1994. But when else? Heron was as surprised as anyone else by its sudden elevation to masterpiece status. When, incidentally was Olitski first shown at Kasmin Gallery, and what paintings were shown.? To the best of my knowledge the first time Fourteen Discs appeared in public was in Colour in Modern Painting at Stoke City Art Gallery in 1990, which I had curated jointly with Ian Vines. This little episode indicates clearly the ironies of how History comes to be written and by whom. To Sam. — I remember meeting Hoyland at the opening of Heron’s Barbican retrospective in 1985. He was very nervous and blushing feverishly. Obviously he thought there was point in a comparison with his own work. And he knew who came out on top. Obviously we know, so can you spell out the implication? What, like you do, not? The implications are that neither of these painters showed any disinterested regard in their later careers for the future of abstract painting (if they ever did, though Hoyland’s seventies homage to Hofmann is of interest in this respect), nor any great inventiveness or originality, and withdrew into their rather similar banal and rather depressingly portentous “Star Trek” configurations and “saucebottle” applications of paint. Neither painter achieves a late synthesis of what they were trying to do in their earlier careers, and I think we have to consider them both with some degree of scepticism as to their ultimate status as artists. Well, we knew that was coming. Sorry to go on about Fourteen Discs, but probably the real reason it was held back for so long is that Heron didn’t quite know whether he liked it or not, since it doesn’t quite conform to his stated intentions and values. “ no section of the picture surface should be less of a shape than any other…… I believe in the formal equality of all sections of the painted surface”. The yellow ochre scribble doesn’t quite sit right, and the blackish billiard ball resting on top of the red rectangle is a bit too real, and as if about to move. But it is just this animation that pulls it all into a gentle push and pull, foreign to his intentions perhaps. It should be compared with Hofmann’s In Sober Ecstasy, to see what it was that repelled Heron about the Hofmann dynamic. 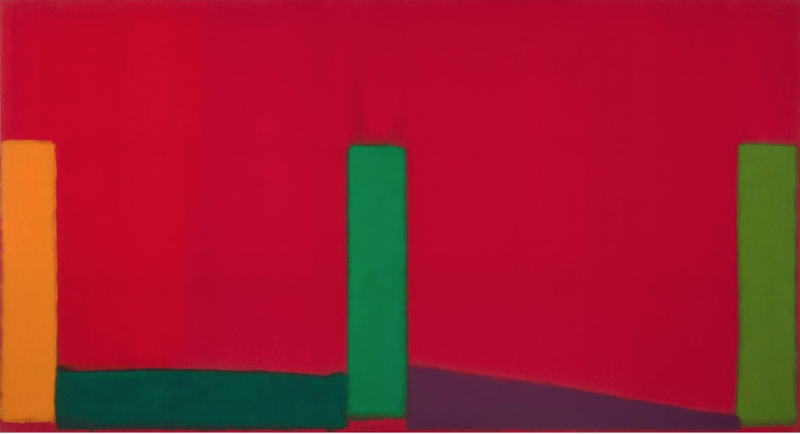 Robin, since no one here has been arguing that either Olitski or Hoyland was a great artist late in his career, what’s the point? The point is that their respective early work is rather limited, and does not lead us to a later emergence of any greater impressive creativity, but remains the best of their careers. Actually, more to the point is to not put these guys on high pedestals, but to learn from the bad as well as the good about them, and to move on, and not keep repeating this kind of stuff.